When natural disasters strike, a mobilization of relief workers from various agencies such as the Red Cross, National Guard, and FEMA are ready to respond, bringing in food and water, working to restore power, and setting up temporary shelter to assist in returning the disaster zone and the lives of those within it back to normal. Animal rescuers also play a vital role in rehabilitating disaster touched habitats. 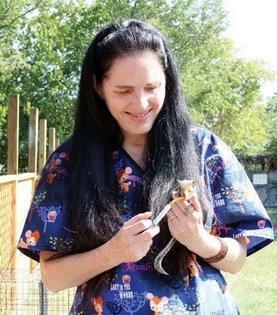 One local resident and licensed wildlife rescuer, Birgit Sommer, who operates Rainbow Wildlife Rescue in Stephenville, recently made a trip to the Metroplex to pick up 15 baby squirrels orphaned by Hurricane Ike. Sommer said with the assistance of locals, she hopes to bring more homeless squirrels to the area. “Hurricane Ike has left literally thousands of baby squirrels orphaned on the ground in Houston and in the surrounding areas,” Sommer said. “One wildlife rescuers alone received 730 infant squirrels!”In the days following Ike’s destruction, Sommer said her phone has been ringing non-stop and e-mails began piling up, all from people looking for refuge for baby squirrels they had rescued. She said many of the people seeking help didn’t even have electricity to care for themselves and their families but they were still taking in the tiniest of hurricane victims. While Sommer was only able to bring 15 squirrels home in her first round of aide, she hopes to bring more to her local sanctuary on East Clifton. She said when she picked up her tiny patients, she was told about 600 more were on their way to Dallas. The problem is that not just anyone can adopt a baby squirrel. You have to have a state wildlife rehabilitation permit, which Sommer does. “With a little bit of help and effort I could take in twice or even three times as many,” Sommer said. “I just need more outside cages.” Sommer said donations to her local rescue efforts have been scarce and since she does not get funding to support her cause, she needs help caring for her new furry friends. Sommer said local organizations, including Ark Veterinary Hospital and the Girls Scouts have offered assistance in the past. She also said the Boy Scouts have offered to help. “The Boys Scouts are planning a fund-raiser to help get the funds I need to build more enclosures,” Sommer said. In addition, Sommer said members of Tarleton State University’s Student Wildlife Society have stepped up to help. The club organized a fund-raiser and also plans to visit local hardware and supply stores this week to see if local retailers have any materials they would be willing to donate for the cages. One member of the Wildlife Society, Danielle Meyers, who is majoring in wildlife management, said she and other members are working on a letter to distribute to managers of local supply companies to solicit donations. Sommer said she is in need of materials to build outside enclosures, as well as a garden utility shed to store cages and food. The young orphans are fed milk replacers. How can you help? While taking in a few orphaned squirrels is only an option for licensed rescuers, Sommer said donations would go a long way in saving the baby squirrels. Monetary donations, as well as supplies, are needed. Materials used to construct outdoor enclosures include: 1/2 inch galvanized hardware cloth (most useful at the moment); 50 ft. privacy fence panels; concrete for cage foundations; 2 x 4’s and plywood for bottom frames and back walls. Or if you have unused cages such as large ferret type cages with enough room for squirrels to climb around in, they too would be appreciated. For more information on the Student Wildlife society, visit www.tarleton.edu/~wildlifeclub.